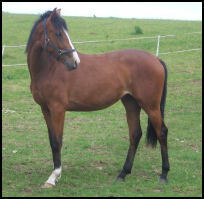 Blacklaw Cherry is a homebred mare to mature approximately 16.1hh. She is out of winning Point to Point mare Hazel Park and her Sire is SSH Graded Dramiro (Keur). Dramiro is a Grade A Showjumper with a fabulous temperament who has turned his hoof also to eventing, dressage and vaulting. His Sire Ramiro is world famous and appears in many top pedigrees today. His Dam Zolinda is beautifully bred by International showjumper Joost. She has also produced Idaho an approved stallion in Belgium and Odlinda who won the Eindhoven Derby. Cherry is a full sister to Blacklaw Thymelord currently eventing with Ruth Edge. The plan is to back Cherry 2011/2012 and she may be sold or retained as a broodmare.